$295 Free Shipping Continental U.S.A. Absolutely invaluable, MUST have book for the Featherweight owner! Wonderful to own, perfect to use. Excellent, Collectible Condition. Compact 6” by 8” 203 page book. Very hard to find book for those interested in expanding their knowledge of the care and use of their featherweight and related attachments, fashion aid and accessories. All instructions are detailed, remarkably easy to follow, complete with pictures and written to ensure your success. Chapters 1-2 cover care topics such as cleaning and oiling, common causes of machine troubles, adjusting tension, needle insertion…and more! Chapters 3 through 7 cover the use and care of regular attachments, fashion aids and accessories. Included is concise, easy to use chart (page 126) listing different singer machine models, and the names and part numbers of the attachments, fashion aids and accessories. Exactly what you need, to know if that perfect attachment really will work on your machine!! Chapters 8-9 extol the virtues of the electric machine and let you know how that your electric machine complete with an electric light actually does work. Clearly a trip back in time to add to your knowledge of singer history!! 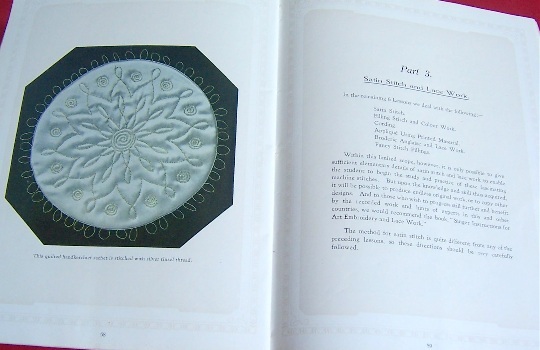 .Machine Embroidery book by Dorothy Benson Published by Singer Sewing Machine Company, Ltd., Educational and Embroidery Department, London, England. A delightful, informative and easy to use book with excellent pictures throughout. Opens a world of possibilities using your own designs and machine needleworking skills. A must have for all of those with machine embroidery on their horizons! This book is divided into three parts; 18 lessons and 79 pages. Part 1: “Decorative Stitching using the Sewing Machine, with the Presser-Foot” includes eight lessons beginning with “Borders in Plain Stitching” and ending with “Quilting”. Part 2: “How to Embroider on the Sewing Machine” includes ten lessons beginning with “Simple Designs in Darning Stitch and ending with “Free Quilting”. Part 3: “Satin Stitch and Lace Work” includes six lessons beginning with “Satin Stitch” and ending with “Fancy Stitch Fillings”. Attachments listed as necessary are a feed cover plate (121309 or 108002), spring darning or embroidery foot and a thin pair of embroidery hoops. Note: If you wish to purchase more than one item, simply enter your personal data for the first item and click on buy now for each additional item. Inventory is updated daily. Items are available on a first come, first served basis.